Travel advice from kidz... for everyone. Port Douglas is a beautiful town in Far North Queensland and is a very popular destination for people wanting to experience the Great Barrier Reef and the Daintree Rainforest. Port Douglas is so unique that it is the only place on Earth where 2 World Heritage listed places meet. 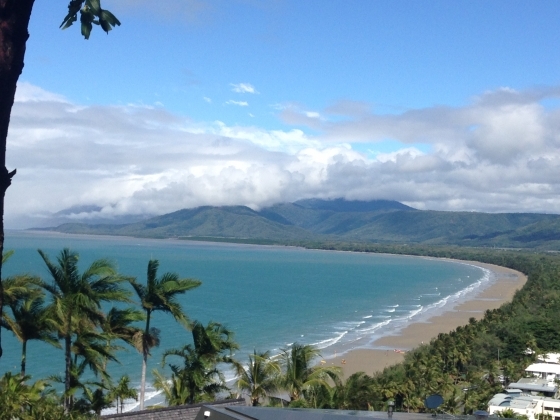 The World Heritage listed Daintree Rainforest and Cape Tribulation meet at the waters edge of the Great Barrier Reef. We flew into Cairns and enjoyed the beautiful drive to Port Douglas, there are so many lookouts and great photo opportunity’s that it took us way longer than we expected to get to get there. The whole trip I kept my eyes open for Cassowaries; I wanted to see one so badly.. as long as I was in the car that is. We took Tony’s Tropical Tours for a Rainforest wilderness experience. Our tour took us to Mossman Gorge, which contains the oldest, continuously surviving rainforest on earth. The Kuku Yalanji people are the Indigenous inhabitants of the land have a history dating back 50,000 years to the earliest human occupation of Australia. Our guide shared with us the story of their magnificent land and pointed out some amazing examples of native fauna and flora. In case you didn’t know, just one hectare of the 120,000 hectare forest can contain over 30,000 species of plants and animals and is said to be the evolutionary cradle for many of Australia’s plant and wildlife species,. The Daintree forest has managed to survive for over 135 million years. From the Gorge we took a river cruise on the Daintree River. I have to admit I was a bit nervous sitting on the boat with crocodiles floating past. The Daintree River has an amazing amount of native and migratory bird life and butterflies. Once we crossed the river we went to the Alexandra Lookout to enjoy the views from the Daintree River Estuary to the Coral Sea, and then we stopped at a place called Noah Valley, it is a World Heritage Listed private property. While we were walking through the rainforest we kept our eyes open for cassowaries but thank goodness didn’t see any. We did see lots of birds and spiders and lizards though and the way they camouflage themselves to adapt to their environment to hide from predators is amazing. The weather wasn’t the best so rather than do an all day trip to the Great Barrier Reef, we decided to take the Reef Sprinter out to the Reef to do some snorkeling. The Low Isles Reef is just 15 minutes away from Port Douglas and it is so fast you have too much fun to get seasick! The Low Isles is one of the Great Barrier Reefs most spectacular coral cays but if you aren’t up to snorkeling, there is a glass-bottomed boat to make sure you get to see the coral and the fish. It was so sad to see how badly the reef was damaged in a really bad storm they had 6 months before our visit. The coral in some areas was grey and dead and the marine biologists told me that there are many parts of the reef dying the same way but it is caused by pollution and destruction from humans. He told us we are losing the battle to protect the reef and that almost made me cry. I don’t know why we have to destroy beautiful things, please help preserve this amazing underwater world at our own backdoor. We jammed so much into our week at Port Douglas; I begged mum and dad to take me back so I can relive the amazing experience of staying in paradise. When I got back to school a friend asked me to describe Port Douglas to her and I found it hard to put into words how amazing it was. So I said to her pick the best place you have ever been to, deepen the colour of the picture, add the smell of rain and the feel of sunshine on your skin and then multiply it by 100. That’s Port Douglas!